Being a top-10 draft pick may seem like the culmination of a lifelong dream, but any hockey player will tell you it’s only the first step on a long NHL journey. For Jack Skille, the seventh overall selection in the 2005 NHL Entry Draft, being chosen by the Chicago Blackhawks was just the beginning of a career that has seen its fair share of ups and downs. Before he broke into the big leagues, the Madison, Wis., native spent two years with USA Hockey’s National Team Development Program, an experience he credits with improving his discipline and work ethic. He’s carried those lessons with him, first to the University of Wisconsin where he won the Frozen Four as a freshman, and throughout his NHL career. After four years of moving back and forth between the Blackhawks and their AHL-affiliate, the Rockford IceHogs, Skille was traded to the Florida Panthers, where he spent three seasons. USA Hockey History: Spent two seasons at the National Team Development Program (2003-04, 2004-05), a member of the 2006 and 2007 U.S. National Junior Teams, and played in the 2011 World Championship. In 2013, he signed as a free agent with the Columbus Blue Jackets but was sent to the minors just 16 games into his time there. It was a challenging experience but one that he credits with helping him grow both as a player and a person. 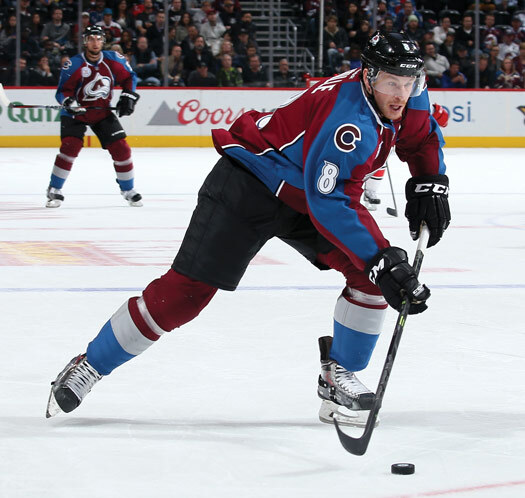 Staked with a newfound confidence, Skille signed a one-year contract with the Colorado Avalanche in October 2015. So far life in the Mile High City has given him a new lease on his professional life. With his new team, Skille seems to have found the right fit. Halfway through the season, he had already tied his career-high with seven goals. “This team is by far the tightest group of guys that I’ve ever played with. It just makes you want to win every single night when you care about every guy in your locker room,” he said. Still, Skille knows he can’t get complacent. If there is one piece of advice Skille wants to give, it’s that hard work and determination are the most important traits for anyone who aspires to play hockey on any level. “You have to work harder than anybody else out there. Not just the kids that you’re playing with, not just the kids that are in your local area; you have to think about the kids everywhere,” he said. Even before Brenden Justice was born, his hockey career seemed to be over. Brenden was born with a congenital heart defect known as Tetralogy of Fallot, and at 7 months old, needed open heart surgery. His parents were told that he would probably never be able to play contact sports. 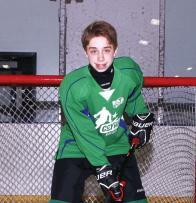 Undeterred by his supposed limitations, Brenden began learning how to skate when he was 10. When his cardiologist finally cleared him to play hockey a year later, Brenden attended the Columbus Blue Jackets’ hockey camp. Brenden’s love for hockey is evident in the way he is always quick to rise in the morning to attend an early game or practice. He knows that the only way to improve is to practice, which is why he spends hours on his family’s backyard rink, trying to perfect his skating, shooting and stickhandling. Brendan’s determination and work ethic are always on display when playing right wing with the Canucks in the Columbus Chill Youth Hockey Association. Away from the rink, Brenden is an honor roll student who gives 100 percent in every aspect of his life. He plans to play hockey for as long as he can.